Neighborhood safety is often a main concern of homeowners and unfortunately, even the safest community is susceptible to crime. According to the preliminary 2012 Uniform Crime Report published by the FBI, nearly every U.S. region saw an increase in violent crime, robbery, aggravated assault, property crime, burglary and larceny-theft since 2011. With crime rates on the rise, it’s important to take action with your community to preserve the safety of both your home and neighborhood. Here are a few tips that can help your community work together to keep crime off your streets. One way to take crime out of your community is through a neighborhood watch group. Watch groups aren’t made up of vigilantes – they are volunteers within a community who look for and report suspicious activity to the local police department. Watch groups provide neighborhood surveillance when police aren’t around, which can effectively reduce the amount of opportunities for crime. Police are a major source of training and support for watch groups, so contact your local police department for more information about groups in your area. If you’re interested in creating a watch group, you can find resources online at www.USAonWatch.org, a neighborhood watch program created by the National Sheriff’s Association. Another way to reduce the risk of crime is by investing in your neighborhood’s curb appeal. 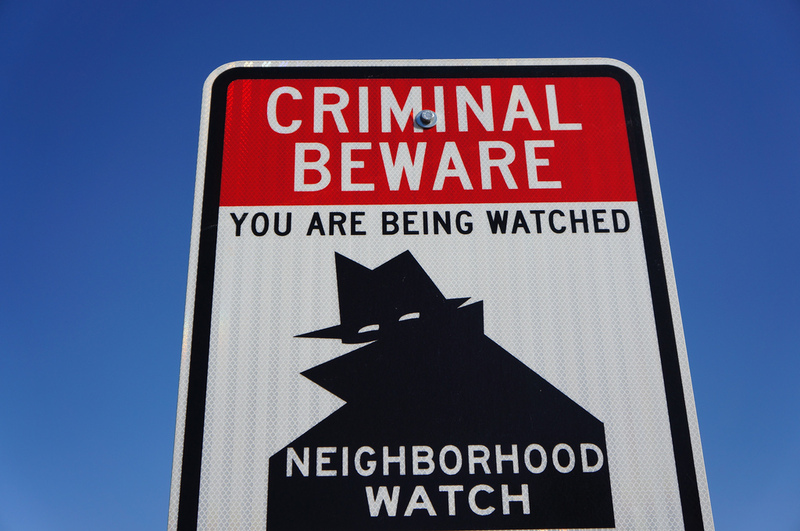 The physical environment of your neighborhood can play a role in a criminal’s risk assessment. Research from the National Institute of Justice found that “deteriorating” neighborhoods (homes with overgrown landscapes, vandalized buildings, trash, abandoned vehicles, etc.) have higher crime rates than those that are well-maintained. Criminals perceive these areas as vulnerable with a low risk of being patrolled or responded to by police. Talk to your neighbors about joining your city’s community clean-up program. If your city doesn’t offer a program, create one. Ask homeowners in your community to participate and explain the importance of keeping your neighborhood clean. Community crime prevention is a team effort, but you can also do your part to deter burglaries by investing in a home security system and encouraging your neighbors to do the same. A five-year study conducted by researchers at the Rutgers University School of Criminal Justice found that neighborhoods in which security systems were densely installed have fewer incidents of burglaries than neighborhoods with fewer security systems. The study noted that security systems make a home look less attractive to burglars without displacing burglaries to nearby homes. You can find a trustworthy security company in your area by searching the Alarm.org database. A professional security company will be able to recommend a security system that works with your lifestyle. Then, talk with your neighbors about how security systems protect their homes, as well as the neighborhood as a whole. While neighbors can help keep an eye on your home while you’re away, they won’t be on watch 24/7. Fortunately, smart home technology can help. An enhanced home security system, complete with IP surveillance cameras, allows you to login remotely to view the activity in your home from a smartphone, tablet or computer. But, peace of mind isn’t the only perk that interactive services and integrated systems can provide. An enhanced security system gives you the added convenience of never having to wonder if the door is locked, whether or not your security system is armed, if you left the lights on or remembered to lower the thermostat. Through a web-enabled device you can remotely secure unlocked doors, arm or disarm your system, turn lights on and off and warm up the house on your way home with the push of a button. A trained professional with experience in enhanced home control can help you create an easy-to-use system. Make safety the topic of this year’s neighborhood block party. Enlist help from your community, a trustworthy security company and a little technology to make a positive impact on the safety of your neighborhood.